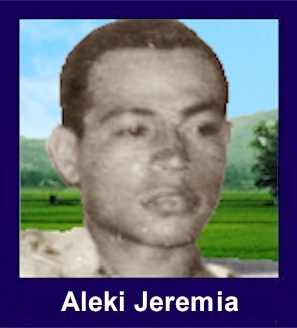 The 35th Infantry Regiment Association salutes our fallen brother, SSG Aleki Jeremia (Ieremia), who died in the service of his country on February 20th, 1968 in Binh Dinh Province, Vietnam. The cause of death was listed as Mortar. At the time of his death Aleki was 32 years of age. He was from Pearl City, Hawaii. Aleki is honored on the Vietnam Veterans Memorial at Panel 40E, Line 41. The decorations earned by SSG Aleki Jeremia (Ieremia) include: the Combat Infantryman Badge, the Bronze Star, the Purple Heart, the National Defense Service Medal, the Vietnam Service Medal, the Vietnam Campaign Medal and the Vietnam Cross of Gallantry with Palm Unit Citation. He was born on July 1, 1935 and passed away on February 20, 1968 at the age of 33. This is just a little information I know about my Uncle Aleki T. Ieremia. Aleki was married to Ulata Mikaele in 1956 before he left for Hawaii. He joined the Army in Hawaii and listed Hawaii as his home address, but he is truly from American Samoa. Perhaps that is why he changed the spelling of his last name to a "J" Jeremia instead of Ieremia so he could easily get in to the army. In those days, very few American Samoans were allowed in to the military. I know he died from Vietnam in 1968. His coffin was not allowed to be open. So my mother Venetta Allen still believes that her brother is still alive somewhere in Vietnam. Mr. Aleki Ieremia was my classmate at High School of American Samoa (now Samoana High). He was a great musician; he could play the trumpet, French horn, and piano. We were both members of our high school band. I was stationed at Da Nang Air Force Base in Vietnam when I heard of his passing,it was a very sad day for all of us who knew him well. SSG Jeremia was my squad leader; came to us after my former squad leader SSG Freddie Lee Thomas was KIA on 11/9/67. SSG Jeremia has always held a place in my heart nearly the equal of SSG Thomas. He was a very veteran sergeant and we were mostly 19-20 years old so we did not always like what he "suggested" we do but, as the old saw goes, I realize now he was only trying to keep us alive. For instance, now I still do not know what was SOP over there---but we seldom carried a spare M-60 barrel--until SSG Jeremia arrived. He not only insisted on the spare barrel--but the asbestos gloves to allow changing a hot one as well! Of course, I delegated all that to Burkhart which made Don very happy--lol. The guy could shinny up those coconut trees in a heartbeat! In my minds eye I can still see him smiling broadly down at us from the top of one of those trees. When not chewing our butts he was truly a friendly and happy-go-lucky guy. He had a great love for music which he spoke to often.